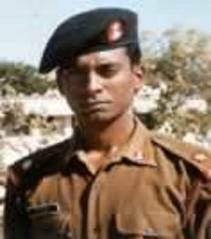 Major M Saravanan was born on 10 Aug 1972 in Rameshwaram in Tamilnadu. 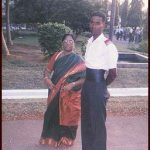 son of an army officer Lt Col Adi Mariappan and Amrithavalli Mariyappan, Maj Saravanan had made up his mind to follow in the footsteps of his father since his childhood. His father Lt. 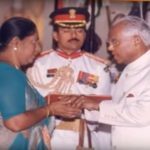 Colonel Adi Mariappan a doctor in the army died in a road accident in Bangalore in 1989, while serving in the Indian Peace Keeping Force during Operation Pawan in Sri Lanka. Maj Saravanan, after completing his schooling in various places — Belgaum, Kannoor, Gurdaspur, Jorhat, and Bihar, had joined St Joseph’s College in Tiruchirapalli which was founded in 1844. 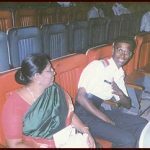 Maj Saravanan during his college days was also the president of the student union at St. Joseph’s College in 1992 and was a C certificate holder of NCC. 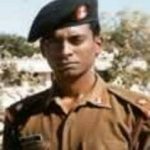 Maj Saravanan graduated from the OTA in 1995 and was commissioned into 1 Bihar of the Bihar Regiment, a regiment known for its numerous battle honours. 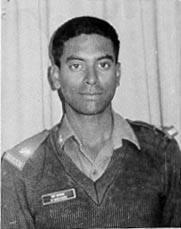 After passing out of OTA, he was posted to Tamulpur, Cooch Bihar, and Bhutan before moving to Kargil. He was promoted to the rank of captain in 1996 and major in 1999. 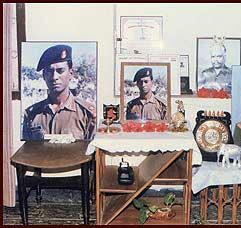 Major M Sarvanan’s unit was moved from Assam to Jammu & Kashmir for the Kargil operation in 1999. 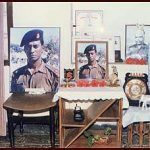 He wrote to his mother that he had been waiting for just such an opportunity and would bring home a “Vir Chakra”. Operation Vijay was launched on 26 May and his unit was tasked to capture Point 4268 in Jubar Ridge located on the western side of the Batalik sector, the second highest battlefield in the world after Siachen. The terrain comprised of jagged rocks covered with snow and knife-edge ridges with no greenery. 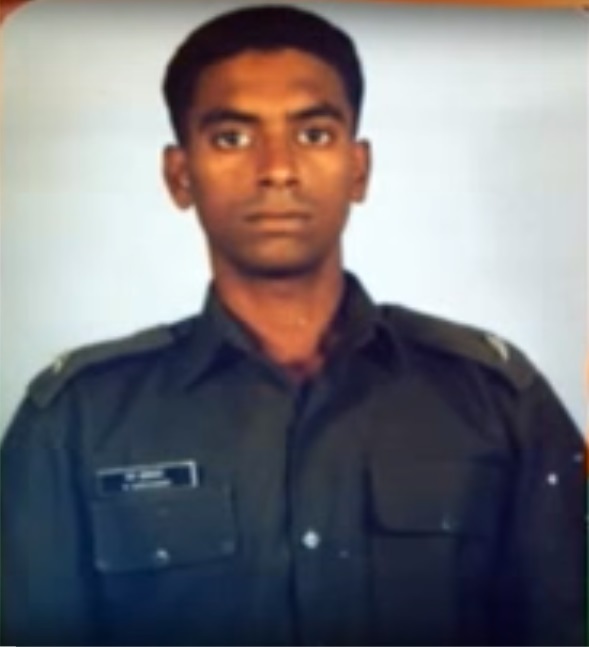 Following the failure of two attacks, Major Saravanan volunteered to launch the third attack. A frontal attack was the only way. The enemy was well entrenched on heights but the steep climb did not deter him. The attack was launched at 4 a.m. on 29 May with his final command to the men, “Do or Die”. He killed two enemy soldiers by firing a rocket launcher and was wounded in the stomach by shrapnel, but he did not give up. His commanding officer asked him to fall back in view of many casualties. Maj Saravanan replied that he was close to the objective and would not spare the enemy who had killed his men. 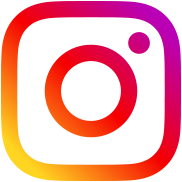 He added, ‘Nothing will happen to your Genghis’, which was his code name. He charged through a hail of bullets and killed two more enemy soldiers. He was the first to reach the top but received a bullet injury in the head at 6.30 a.m. and fell into a ravine. His unit 1 Bihar took an oath to capture Point 4268, which they did by 6 July. 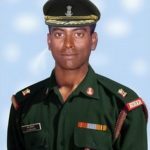 Major Saravanan’s body could be recovered, 37 days after his death, following a bitter fight. The entire Jubar ridge was cleared by 8 July. 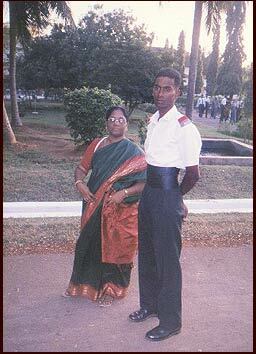 The body of Major Sarvanan was brought by air and the Tri-colour draped coffin was placed at the feet of his mother. Hundreds of garlands were placed on it and thousands of people came to pay homage to the hero of Batalik- the first officer casualty of Operation Vijay. 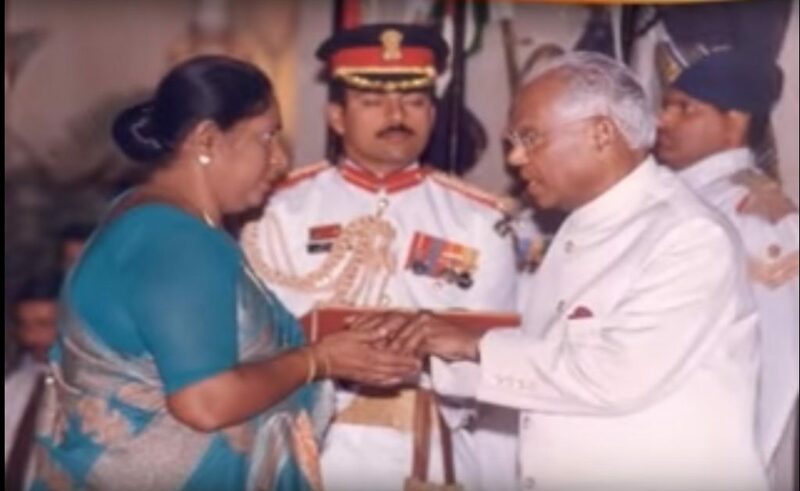 He was posthumously awarded the Vir Chakra and it was presented to his mother by President K Narayanan. 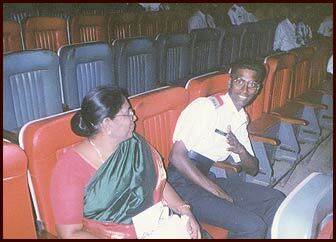 Major M Saravanan is survived by his mother Amrithavalli Mariyappan, and two sisters Chitra and Revathy. 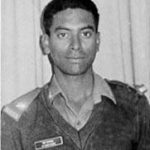 Major M Saravanan was the Company Commander of one of the companies of 1 Bihar launched in the battalion attack on Point 4268 in the Batalik sector during “Operation Vijay”. 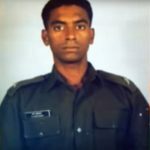 While moving forward to eliminate the last position held by the enemy, Major Saravanan was fired upon by the enemy with a heavy volume of small arms fire. Unmindful of the enemy fire, he crawled forward to destroy the last remaining enemy position and before being fatally hit by an enemy bullet, killed two enemy soldiers. Major M Saravanan displayed exceptional bravery, valour, and exemplary leadership, fighting from the front, destroying two enemy bunkers and killing few enemy soldiers before laying his life for the motherland. 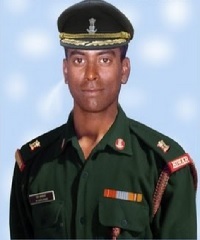 Major M Saravanan was posthumously awarded the gallantry Award of “Vir Chakra” for his outstanding bravery and sacrifice. Maj Sarvanan’s mother Amithavalli Mariappan paying tribute to her son said ” Saravanan was very industrious, always busy fixing his bike or other electrical items in the house. He hardly ever sat still. He was a good son who came home every year for his holidays. When he had told me that he wanted to join the Army, I never discouraged him even after losing my officer-husband”. 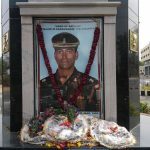 We salute for your great sacrifice for our country sir Jai Hind…. Jai Hind – Vande matharam. Rest in power sir !!! Jai Hind!!! Such an Extrodinery personality, sir we are there ,we’ll make you proud by joining the army and do the duty which you left for us. 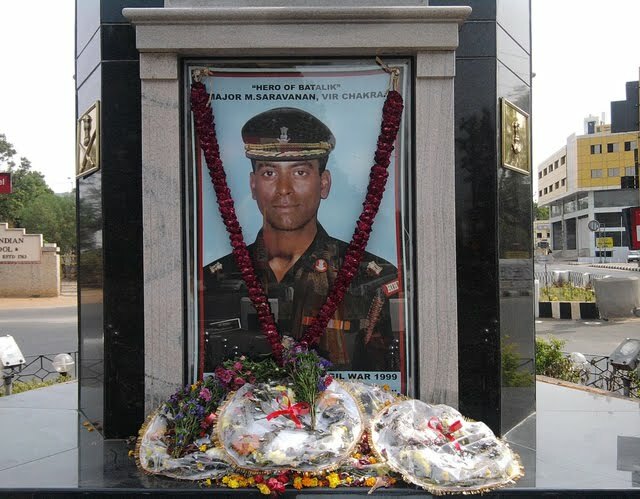 majaor.m.saravanan is saga of brave who made the supreme sacrifice to Hindustan. proud to say im from his motherland.